Selected WHS students will be given complete access to theWaldwickWHS Instagram account to share with everyone what their day/week looks like. Each week I will be selecting someone new to take over the account. The selected student will be signing all of their posts with their initials. During the week of January 16, 2017 - Junior, Kristen Gimelli was the guest Instagrammer. Below are all of the posts by Kristen for the week. Thanks Kristen for telling your story to the Waldwick community. During the week of January 9, 2017 - Junior, Patrick Keastead, was the guest Instagrammer. Below are some of Patrick's posts form the week. 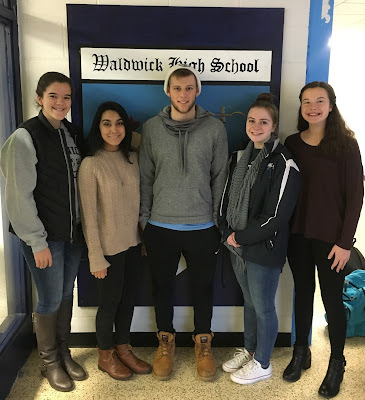 If you are an Instagram user please consider giving us a follow: WaldwickWHS Instagram Thanks Patrickfor telling your story to the Waldwick community. Selected WHS students will be given complete access to theWaldwickWHS Instagram account to share with everyone what their day/week looks like. Each week I will be selecting someone new to takeover the account. The selected student will be signing all of their posts with their initials. Duringthe week of January 2, 2017 - Senior, Johnny Chiurazzi, was the guest Instagrammer. Below are all of the posts by Johnny for the week. Thanks Johnny for sharing your week with the Waldwick community. During the week of December 19, 2016 - Senior, Madison Conlon, was the guest Instagrammer. Below are all of the posts by Madison for the week. Thanks Madison for sharing your week with the Waldwick community. EMER BROPHY - Emer is a pleasure to have in class. She is currently a freshman in Honors Algebra I. Emer is a very motivated student, always demonstrating a terrific work ethic and a positive attitude. She enjoys the challenge of honors level math. Emer takes her work seriously, but also has a good sense of humor. Emer is always prepared and works well individually and in groups.